Wind Turbine Noise: What you can’t hear can harm you. The Freedom wind facility turbines started turning in the fall of 2008 and noise measurements from this site could have been used for reference for subsequent permitting applications at similar sites. The Vinalhaven permit noise analysis was submitted in April 2009, after the Freedom facility became operational. The results of our noise measurements and subsequent analysis raises this question: was the opportunity for evaluating the Freedom wind turbine sound emissions overlooked during the Vinalhaven application process? Posted Jan. 13, 2015, at 10:16 a.m. The Maine Center for Public Interest Reporting recently published a damning report detailing how easily the Maine Legislature bends to the wind power industry. In “LD 1750: A study in how special interests get their way in the Maine legislature,” Pine Tree Watchdog reporters detail how Juliet Browne, First Wind’s lawyer, sent former Senate President Justin Alfond suggested text for an amendment relating to a wind power bill. Alfond ultimately adopted all 248 words she supplied, changing nothing. Neighbors of wind turbines on Vinalhaven have a different story and outcome to tell. In 2013, they proposed a single legislative change, to require that all Maine wind turbines conform to noise limits set by the Maine Department of Environmental Protection in 2012; 42 dbA instead of the previous 45 dbA at nighttime. But many of the justices’ questions focus on whether they should rule on Department of Environmental Protection decisions. PORTLAND — A five-year fight by residents living near the Fox Islands Wind project on Vinalhaven got a high-stakes airing on Tuesday, as the Maine Supreme Judicial Court heard an appeal dealing with state noise regulations for wind turbines. It has now been five years since the Vinalhaven (ME) wind turbines were turned on, saddling neighbors with wind turbine noise that often exceeds state noise standards. Some wind enthusiasts are still convinced embracing three wind turbines on Vinalhaven is doing something “good”. But “wind plants are gas plants”, says Robert F. Kennedy, Jr. and to understand why, listen or pick up at 2:15 min. VINALHAVEN — Sally and David Wylie are having an addition built onto their island vacation home. A patio door admits views of the woods and water, but the sunny, southern exposure has no windows. That south wall is a foot thick, and stuffed with sound-deadening insulation. Sally and David Wylie of Vinalhaven are building an addition to their home with sound-deadening walls to escape the “whomp, whomp, whomp” generated by turbines at the Fox Islands Wind Project. The following was sent to the Bangor Daily News, by Fox Islands Wind Neighbors after the recent news report that included data on FIEC rates. Our chart is based on the exact numbers provided to all ratepayers by FIEC. If you think the wind turbines are saving you money, check the numbers: the numbers don’t lie. 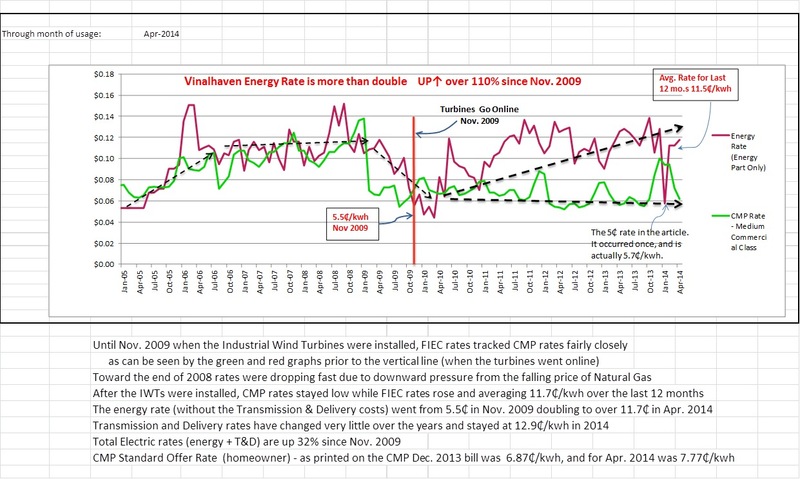 “As neighbors fighting the wind turbine noise on Vinalhaven, we have paid close attention and tried to understand the ways in which ratepayers on the island are being misled about the trend in rates upward. Often, media reports on the Vinalhaven situation — and wind power in Maine as a general matter — fail to get to the underlying economic / financial data. This is a difficult analysis, I know from experience, but it appears to us that you simply took the Vinalhaven electric utility’s word on the matter of the 5 cents per kilowatt hour. That’s a number, by the way, that taken as a single data point would be impressive to the folks who are lending FIEC the money, but it is not indicative of the rates for the year, and itself is not even accurate (the actual January energy rate was 5.7₵/kwh – closer to 6₵ than the 5₵ stated). In the article you also say: “Generally, the price for customers is 10 to 11 cents per kilowatt-hour, Farrington said.” That’s certainly better than saying we all paid 5₵/kwh, but the real numbers say even the 11₵/kwh is inaccurate: the actual average energy rate for the last 12 months was 11.5₵/kwh, and for the 2013 year was 11.8₵/kwh, both more than the 11₵/kwh you quote Mr. Farrington as saying. Because the electric utility has been fairly cagey about what it is charging ratepayers, I would be suspicious about the statement you make “The cooperative was able to sell electricity to ISO for 14 cents per kilowatt-hour during the past winter”. I would be curious if you actually saw the purchase agreement or evidence where ISO/NE paid 14 cents per kilowatt hour for the winter. This is very tough information for citizens to ferret out. Still, from our point of view, where there is smoke there is fire and with the Vinalhaven electric utility there is plenty of smoke. We hope you can reassure us that BDN reviewed every data point from its original source — not just one data point — or can explain why.